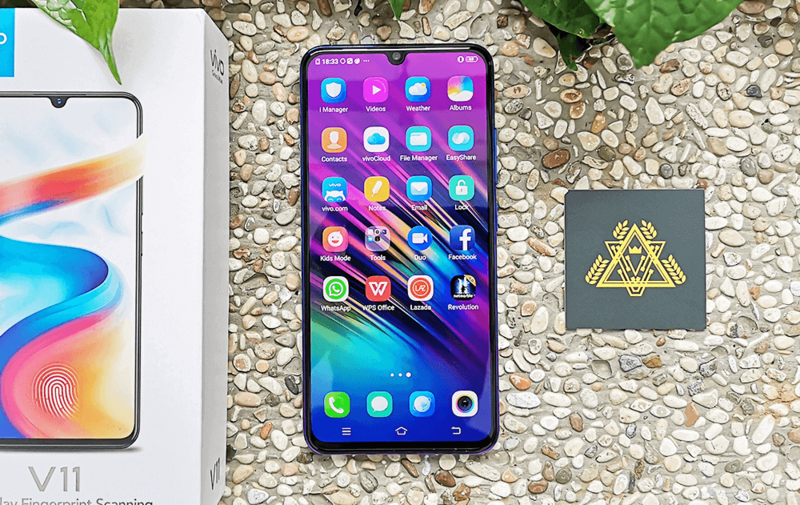 The Vivo V11 (also known in some countries as Vivo V11 Pro) is a mid-range smartphone launched in November 2018 in Singapore (September 2018 in China). This phone is the company’s latest take on a smartphone, adopting a massive screen to body ratio and featuring their first in-display fingerprint scanner. Comparing to its predecessor, the Vivo V11 is a nice upgrade especially in terms of the memory and the camera specifications with its superb selfie capability. The V11 continues the company’s pursuit of the perfect shot. 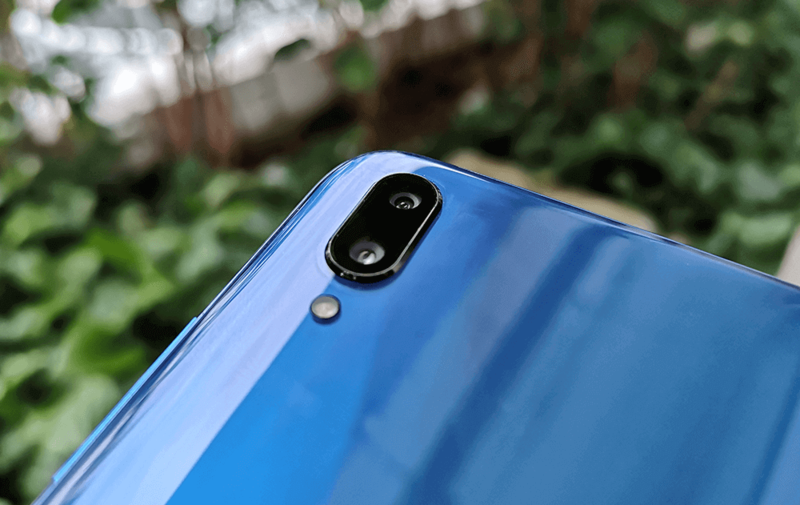 Following with its success of V9, Vivo has stepped up its development of AI to satisfy the consumers’ hunger for more powerful photography features which can adapt to any scenario. Therefore, this new AI-powered addition to the popular V series by Vivo comes with an AI camera that can instantly turn amateurs into near-professional photographers by eliminating typical photography challenges, enabling them to capture picture-perfect moments. The Vivo V11 features key design breakthroughs such as the new Halo FullView™ Display paired with Starry Night and Nebula colors. The V11 is incredibly well-built, and at first glance looks pretty much like a high-end phone. The eye-catching gradient purple and blue color “Nebula” scheme gives the phone a premium touch. It is somewhat similar and made famous by Huawei’s Twilight color variant of the Huawei P20 and P20 Pro. With gradient colors becoming a major trend in 2018, Vivo’s jump on this bandwagon is a smart choice, also taking into consideration that Samsung has also applied the same color treatment to its Galaxy A9 and S9 lineup. The V11 measures 157.91 mm x 75.08 mm x 7.9 mm (height x width x thickness) and weighs 156 grams, making it extremely sleek and lightweight. The phone has narrow bezels and adopts the tiny teardrop-shaped notch which is yet another 2018 trend that is slowly becoming the norm. 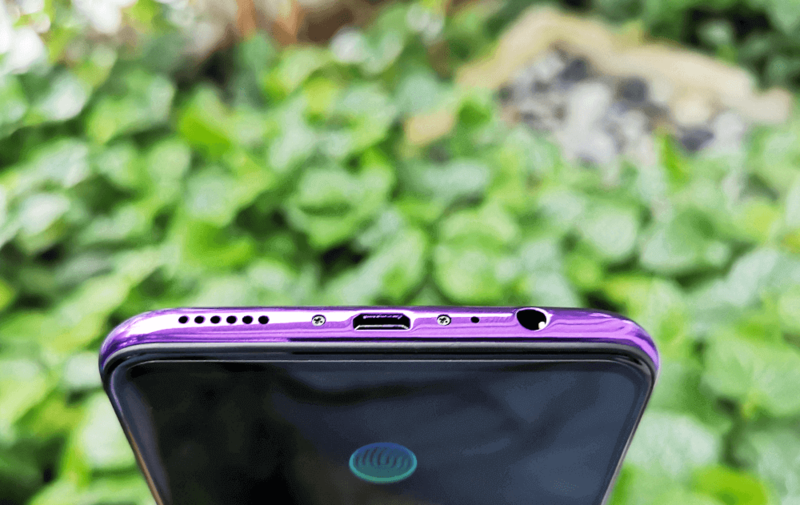 The bottom and sides are quite standard with a 3.5mm headphone jack, micro-USB 2.0 port, speaker grill, volume and power buttons, and nothing out of the ordinary. Flip the phone over, there’s a dual-lens camera and flash, while on the side there is a 3-in-1 SIM tray which allows you to use two Nano SIM cards and expand its memory by up to 256GB via a microSD card. However, one major issue on the design is that the V11’s glossy back attracts smudges very easily. But it’s not an issue if you intend to protect your phone with a phone casing, Vivo has also thoughtfully included a protective casing in the box. NFC and water resistance are also missing in this phone, which is becoming one of the key selling points of many flagship phones in the market such as Apple iPhone X, Samsung Galaxy S9/S9+, Google Pixel 3/3L, LG V40, and Huawei Mate 20 Pro. That also means it won’t survive an accidental dunk in a pool and is incapable of contactless payments. The Vivo V11 has a 6.41 inch 2340*1080 FHD+ Super AMOLED display and is capable of producing incredibly accurate and vivid visuals with vibrant colors and excellent contrast levels. The impressive 91.27% screen-to-body ratio and ultra-thin 1.76mm side bezels create an immersive viewing experience. The Vivo V11 has a dual rear-facing f/1.8 12MP (24 million photosensitive units) main shooter with Phase Detection technology and an f/2.4 5MP depth sensor. Phase Detection Auto Focus (AF) was initially built into discrete AF sensor chips in the DSLR (Digital Single-Lens Reflex) days. It then got integrated into the camera image sensor. It works by having a specialized AF pixels sensors that can detect if specific points in the image were in-focus. The phone also uses its AI capabilities to take photos in a whole new way. It analyses the subject by identifying different objects, elements, and scenes such as ‘portrait,’ ‘food’ or ‘flowers,’ and applies specially customized enhancements. Two particular AI features stand out the most which are the AI Low Light Mode and AI Backlight HDR. Both features use an AI algorithm to capture multiple frames, correcting uneven exposures, and combining them to create perfectly exposed photos. The Selfie camera, on the other hand, has an impressive 25MP sensor which is larger than the Sony Xperia XZ2, but smaller than the OnePlus 6 or Huawei P20. Having said this, the selfie photos came in to be very detailed, even in relatively dim lighting conditions. V11 also introduces their all-new AI Face Shaping technology, with an AI face-modeling algorithm. This feature adds additional treatments to your facial features, creating beautiful yet natural selfies. The improved AI Selfie Lighting feature also offers more lighting effects with AI algorithms that understand how the user’s face works with three-dimensionally with lighting. On top of that, the phone also has AI Portrait Framing which makes framing the perfect shot easier by using AI to guide you into holding the phone at the optimal position for a perfectly framed portrait shot. Vivo V11 runs with the company’s custom Funtouch OS 4.5 on top of Android 8.1 Oreo. Much of the functionalities mirror the iOS user interface (UI), and it’s quite different from the stock Android OS, so there is a learning curve for most users. There is also no option to enable the app drawer if you are accustomed to using the stock Android OS. Despite not being a user-friendly OS, Vivo V11’s OS still does have its nifty features such as Game Mode, Motorbike Mode, Smart Split (split-screen), One-handed mode, App Clone, and Smart click, etc. Game Mode works well to block off notifications when you’re gaming, while also optimizing the phone’s performance by automatically optimizing CPU and RAM usage. Smart Split allows you to use multiple applications by splitting the display into two, and this is especially useful for running games while texting on the go. App Clone, as its name suggests, allows you to clone apps on your Vivo phone and can be very useful if you have multiple accounts for social network like Whatsapp, Facebook. Powered by a Qualcomm Snapdragon 660AIE Octa-core with 6GB RAM and Adreno 512 GPU with 128GB internal storage, the V11 is capable of handling everything from simple operations to intensive gameplay. Multitasking and switching between apps is also not a problem, and the phone can handle these tasks quick and well. From experience, the phone managed to run smoothly for Lineage 2 Revolution (L2R) and PlayerUnknown’s Battlegrounds (PUBG) on medium to low settings but encountered occasional stutter on max setting. Overall, the Vivo V11 offers decent performance for a mid-range smartphone. 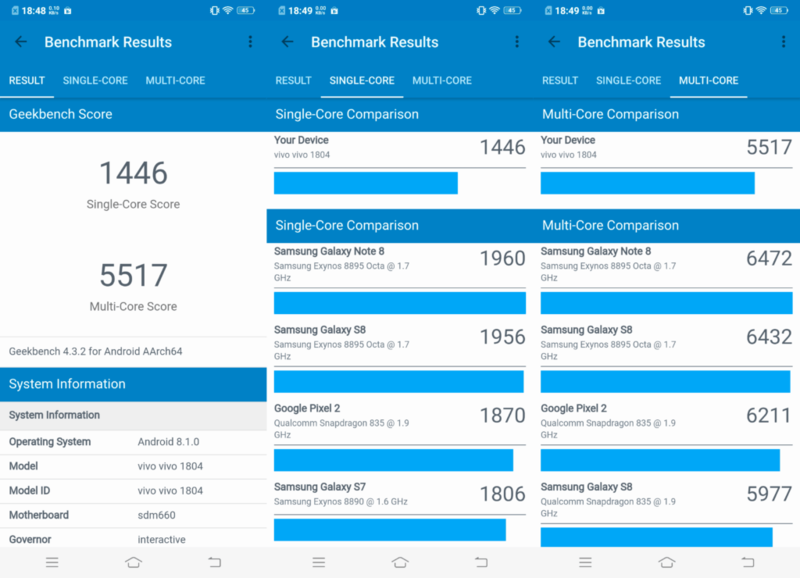 3DMark is a popular benchmarking app that helps to test and compare the performance of smartphone by assessing the GPU and CPU performance of the device. From the tests, the Vivo V11 achieved a score of 1874, 1228 and 1187 respectively for Sling Shot, Sling Shot Extreme – OpenGL ES 3.1 and Sling Shot Extreme – Vulkan. These scores put V11 slightly below average among the mid-range smartphones. Up next, running the Vivo V11 on Geekbench 4, produces a single-core score of 1446 and a multi-core score of 5517. This score also puts V11 on an average position. The 3,400mAh battery on the Vivo V11 lasts at least 13 hours or more with average usage, which is very impressive and very competitive in its category. On top of this, Vivo’s Dual Engine Fast Charging tech fills the V11 up in less than two hours (around one and a half hours). 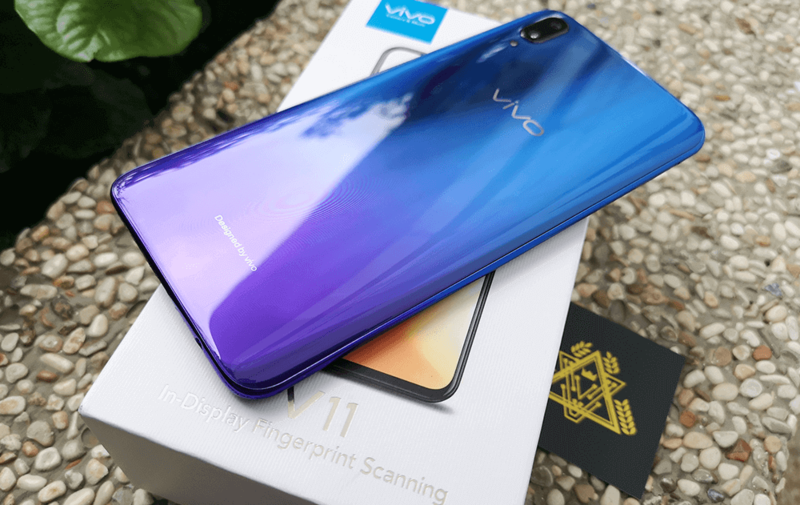 The Vivo V11 is the first in the V series to incorporate In-Display Fingerprint Scanning Technology by the company. This feature continues Vivo’s technology leadership in biometric security while maintaining a sleek and stylish design. The sensor has an always-on option, so you always see a small fingerprint on the screen. Besides, the glowing fingerprint that indicates where to place the finger looks futuristic and cool, and it is also a battery drainer. As far as it goes, Vivo recognizes that the in-display fingerprint technology is not going to be as fast as a physical sensor, and it is not as responsive from our tests, therefore the company has also incorporated the Face Unlock, which works hand in hand with the in-display fingerprint sensor to create a more seamless experience. The Vivo V11 might not be the best phone in the market, but it is one of the better phones in its class. It packs significant improvements over its predecessor, V9, by adopting a better and prettier design and packing more power into the phone. The massive FullView™ Display with its almost bezel-less display is fantastic. Having said this, it is hard to ignore the fact that Funtouch OS hampers the overall Android experience. The rear-facing cameras could be better as well. The lack of an IP rating, NFC, and wireless charging will also disappoint many, but not a deal-breaker. Let’s keep an eye on Vivo, a company that aims to push boundaries with new features and experiences at affordable prices. The phone retails for S$599 (without contract), and is available through telcos M1 Limited (M1), and StarHub, and authorised dealers including Best Denki, Challenger, and Gain City. Vivo V11 might not be the best phone in the market, but it is one of the better phones in its class. It packs significant improvement by adopting a better and prettier design with more power. The massive FullView™ Display with its almost bezel-less display is fantastic.